Conditions looked good yesterday morning as our group of paddlers in the sea kayak class began following the Essex River's serpentine route to the sea. The pesky breeze gave only a hint of what we would encounter after passing Conomo Point. Upon entering Essex Bay and heading towards the northwest, we encountered the mighty power of Aeolus, keeper of the winds, and he was favoring only those heading in the opposite direction. One of the gusts that whipped by us was later clocked in Boston at 37 miles per hour. My daughter was paddling in her very first race and doing a good job of defying the mighty Aeolus's power. At one point he ripped her paddle right out her hands, but she recovered, lowered her head, and paddled onward. 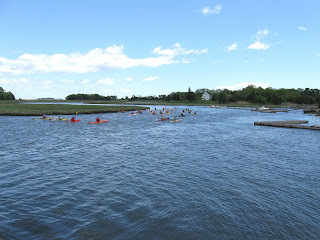 The post-race chowder tasted sweet for all the paddlers and rowers that completed the 5.5 nautical mile course. Race organizers, the Cape Ann Rowing Club, noted that a record 150 boats were entered in the event; everything from paddle boards to 6-man seine boats. The only trash served up was one buoyant tennis ball that may have escaped from the cow-hide bag a crew member on Odysseus's boat was seen untying. That's awesome that you got to do the race together. How cool is that?